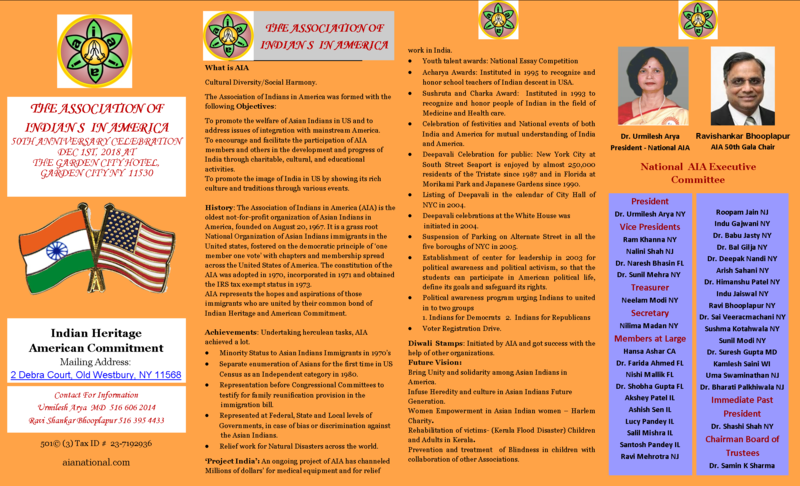 The Association of Indians in America is the oldest national association of Asian Indians in America. It was founded on August 20, 1967 after the United States Congress passed the 1965-66 Immigration Act, repealing the Asian Exclusion Act of 1917. The Constitution of the AIA was adopted in 1970 and was incorporated in 1971. AIA obtained the IRS exempt status in 1973. AIA is the grassroot national organization of Asian Immigrants in the United States, fostered on the democratic principles of "one member one vote", with chapters and membership spread across the United States of America. AIA represents the hopes and aspirations of those immigrants who are united by their common bond of Indian Heritage and American Commitment.